Today we stand fractured as a nation. The umbrella of homogenous national identity is ruptured. We are divided in the way we recall our history, recollect our dreams, and reconstruct the birth moment of our country. 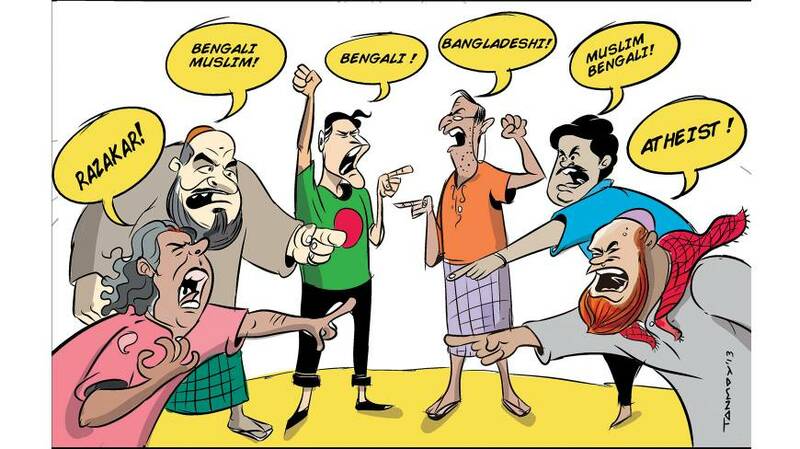 There is only one Bangladesh, but its citizens comprise diverse political and ideological camps. To make the matter more complex, each political-ideological camp whether it is the centre, the extreme left or the extreme right, all believe in polarised binaries. It is no wonder that the counter force to the Shahbagh movement, Hefazat-e-Islam, is demanding the same exact punishment that Shahbagh demanded — a noose. Today you are either an Awami League or Bangladesh Nationalist Party supporter, today you are either “secular-athiest-pro liberation force conscious of its ethnicity as Bengalis” or “Islamic-fundamentalist-religious-anti liberation force conscious of its identity as Muslims first and Bengalis afterward.” What if you don’t want to belong to either of these camps? Well, tough luck! The weakest part of the Shahbagh movement has been its intolerance, its obsession with capital punishment, its tendency to witch hunt anyone who evokes any ifs or buts. What Shahbagh demanded was to take time back, but it is not possible once the clock has clicked away for 42 years. Bitter as bile, we must be able to admit and comprehend what we have become. Bangladesh is not a plain slate like in 1971. Our political past is mired with military coups, military government morphing into democratically elected political parties, not once but twice: under Ziaur Rahman and Hussain Muhammed Ershad, leaving Awami League as the only party with a legitimate political history. The political ideologies upheld by the democratic parties formed by these two military personnel gave space for those who had drifted away from Awami League or differed from Awami League’s position. The defeated forces of 1971 after being restored to Bangladeshi politics followed by the assassination of Sheikh Mujibur Rahman had also grown as a prominent political force under the banner of Jamaat-e-Islam. When Awami League initiated the process to bring war criminals to justice, the majority of the country seemed to have applauded the trial. We all agreed: it has been a long overdue verdict, justice should have been served a long time ago, now is the time to amend past mistakes, we will exterminate the war criminals, we will wipe the slate clean, and we will go back in some imaginary time machine to 1972, and restore our original constitution. The generation that roared at Shahbagh, for the most part, had been born after 1971. They are not the dreamers of a “Shonar Bangla,” but rather the citizens of a harsh Bangladesh where every dream seems to have fallen through the cracks of an inadequate nation-building process. For this disillusioned generation, 1971 appears as a moment of utopia, a moment of possibility, a moment when a new beginning was possible. Thus, they create an illusion of returning back to the moment, imagining that it is possible to wipe the slate clean of the betrayals, blood and utter stupid politics that followed in the years after independence. Shahbagh is no 1971 and murdered blogger Rajib Haider no Asad. The too-quick emotional fireworks of the youth has been championed by politicians. Soon after Shahbagh became a hub of public support, the government infiltrated the movement by putting Awami League’s cultural wing and Awami League’s student leaders at the forefront with Shahbagh blogger leaders. Jamaat-Shibir took a very calculative and measured step in allegedly murdering a person who was at the fringes of the Shahbagh movement, a person who wrote disturbing posts about Islam and the Prophet in the private confine of his computer and personal blogs. After Rajib’s murder while leaders shed tears and named him “Asad,” termed him a martyr, Jamaat played its biggest ploy of publishing the private blogs in public space, in newspapers for the entire country to read. Simultaneously they ran campaigns about the infidelity of the bearers of the Shahbagh movement. The duality of Bengali Muslim identity came in play. We started questioning our priorities, are we to protect our nation’s pride or the Prophet’s? It was indeed a tough call to make. So we fractured into many. Shahbagh had shown us the spirit of the youth, their frustration and their urge to change, but it has also shown us how the spirit of the youth had been neatly championed by political parities; each manipulating the youth for their own, regardless of if it was madrasa kids or the secular kids of Dhaka University. In this chaos, the voice of the youth demanding a Bangladesh where they can grow, has been lost. Now we only hear roars demanding the noose from all sides. It has been the unwillingness of the Shahbagh youth to comprehend the nuances surrounding the history of 1971 that led them to overlook the complicated question of identity. By calling ourselves “Bangalee we excluded the ethnic minorities, we called for rigid positions, we made little children chant “Faashi,” and finally we ignored the complicated fractured past of Bengali Muslims. It is absurd to demand a hardline, black and white truth because our political past is anything but. If we are not able to measure up to our conflicting political past then we can’t hope to solve the problems at hand today. When there are multiple positions and political currents emerging, then it is perhaps best to keep a keen eye open, to examine and understand who we are as Bangladeshis, who we have become over the past decades and who we want to be in the future without holding stubborn blindfolded positions.